Daily Illuminator: Announcing Munchkin Crazy Cooks! August 4, 2018: Announcing Munchkin Crazy Cooks! After yesterday's big announcement (posted here), you might have thought we didn't have anything else cooking this year, but you would be, oh, so very wrong about that. Steve Jackson designed this game, in which you invite over far too many cooks. Munchkin Crazy Cooks is a new, Deluxe-format game that will be on the shelves exclusively at Barnes & Noble in mid-September. But you can preorder on their website right now! Your dwarf, elf, or halfling has hung up their axe, bow, or sword and gone to culinary school to become a BBQ Boss, a Short Order Cook, a snooty French Chef, or even an ultramodern Science Chef. In the process, they've learned that the kitchen is just as dangerous as the dungeon . 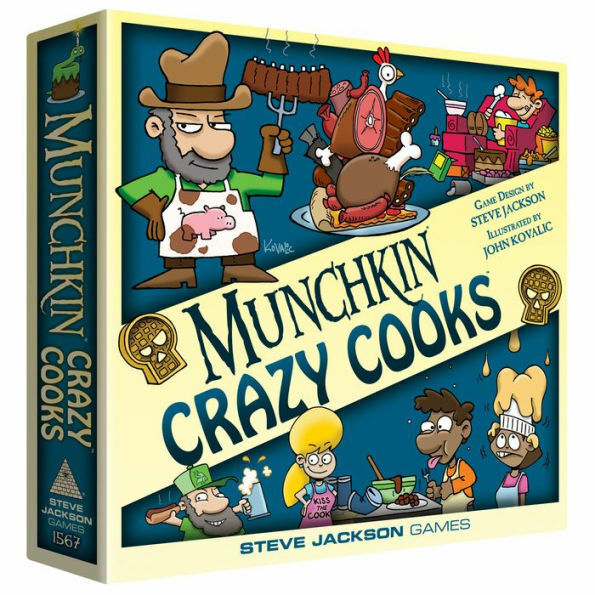 . .
Munchkin Crazy Cooks retails for $29.95 and is illustrated by original Munchkin artist (and unrepentant foodie) John Kovalic.